At a time when a brand new self-help book is hitting the book stores on a weekly basis,what's the relevance of yet another one in the same genre?What more will it have to tell that hasn't been old already?My apprehensions when I picked up this book for review were many.I think atleast a few of you who are avid readers of Indian writing will share my feelings.Anyways,I decided to accept this book for review as the offer for review came through writer's melon,who have sent me some wonderful books in the past.I finished the book in two sittings and I'm quite happy that I actually accepted this work for reviewing in the first place.This book is all about MCC and the methods to overcome it.Well,now you will be thinking what in the world is the meaning of MCC! Okay,MCC is nothing other than Mid Career Crisis.Now don't get me wrong,this book neither explains crisis nor defines it.On the other hand,the book touches upon the myths and effects that cause in us a sense of misery and,thus,a crisis! The book is basically divided into two parts.In the first part,the author tries to analyze the different stages of mid-career crisis and also throws light into the methods to recognize the crisis ourselves where as in the second,he lets the different leaders,(read successful corporate professionals) share their life experiences with us.Though this book packs in a lot of information in it,the good thing is that it's actually quite short.At 170 pages,MCC is quite a crisply edited work. Partha's writing is effective and never lets down the reader with boring blocks of prose.The language is pretty simple and free of any literary pretensions.The use of relatable real life stories and incidents has helped a grea deal in making this book interesting.Though the 'Avik story' some how reminded me of the 3 Idiots prologue(with a positive twist),the author cannot be blamed as it undoubtedly succeeds in conveying the intended message.Like wise,the friendly reminders( not to settle into our comfort zones and the necessity of retaining our signatures in everything we do),helps in making this book unique and noteworthy. 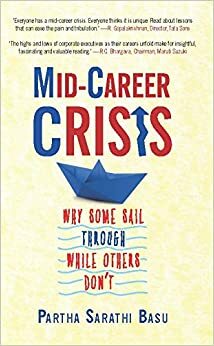 Design and lay out of the book is also competently done.On the whole,Mid Career Crisis is a good work.I'm giving it a 3.5 out of 5.